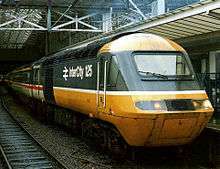 The InterCity 125 was the brand name of British Rail's High Speed Train (HST) fleet, which was built from 1975 to 1982 and was introduced in 1976. The InterCity 125 train is made up of two Class 43 power cars, one at each end of a fixed formation of Mark 3 carriages (the number of carriages varies by operator). The train operates at speeds of up to 125 mph (201 km/h) in regular service, and has an absolute maximum speed of 148 mph (238 km/h), making it the fastest diesel-powered train in the world, a record it has held from its introduction to the present day. Initially the sets were classified as Classes 253 and 254. A variant of the power cars operates in Australia as part of the XPT. After four decades, most of the HST fleet is still in front-line revenue service under privatisation, and while the InterCity 125 brand name is rarely mentioned officially by the private train-operating companies (TOCs), the InterCity 125 still forms the backbone of intercity services on several British main lines. Almost all sets are expected to be replaced by 2018 by the Intercity Express Programme. Under early plans for that programme, some HSTs were due to continue in use on London to Devon/Cornwall services, where there are no plans to electrify the lines. However, in March 2015 it was announced that the remainder of the Great Western fleet would be replaced with bi-mode Intercity Express sets, equipped with the required powerplants and fuel tanks to tackle the distances and inclines of Westcountry services. The power cars have new engines and new lights, and the coaches have been refurbished. The trains currently operate from London Paddington to Penzance, Plymouth, Newquay (summer), Paignton, Exeter, Taunton, Westbury, Oxford, Cardiff, Swansea, Carmarthen, Pembroke Dock (summer), Bristol, Weston-super-Mare, Worcester, Great Malvern, Hereford and Cheltenham; from London St Pancras to Nottingham; from London King's Cross to Aberdeen, Inverness, Harrogate, Hull, Sunderland, Leeds, and Lincoln; on the CrossCountry route from Dundee, Glasgow, Edinburgh and Leeds to Plymouth (plus in summer to Paignton, Newquay and Penzance); from Derby to Skegness (summer only) and also Leeds to Aberdeen. One is in departmental use, as Network Rail's New Measurement Train, converted and in use since 2003. In the later 1950s and early 1960s, the British Transport Commission was modernising its rail network. In particular, it wanted to increase intercity speeds, so that the railways could compete more effectively with the new motorways. The government was unwilling to fund new railways, so the BTC focused its attention on increasing line speeds through the development of new trains and minor modifications to the existing infrastructure. A team of engineers was assembled at the Railway Technical Centre in Derby in the early 1960s, with the aim of developing an "Advanced Passenger Train" (APT), that would be capable of at least 125 miles per hour (201 km/h) and incorporate many features not previously seen on British railways—such as tilting to allow higher speeds on curves. The APT project had suffered repeated delays, and in 1970, the British Railways Board (BRB) decided that it was not sufficiently developed to be able to provide modernisation of the railways in the short term. Thus, at the instigation of Terry Miller, Chief Engineer (Traction & Rolling Stock), the BRB authorised the development of a high-speed diesel train, an operational prototype of which was to be built by 1972, for short-term use until the APT was able to take over. The prototype high-speed diesel train, which was to become the InterCity 125, was to be formed of a rake of passenger coaches sandwiched between two power cars—one at each end. The decision to use two power cars was taken very early in the project—engineers had calculated that the train would need 4,500 horsepower to sustain the required speed of 125 miles per hour on the routes for which it was being designed (the Great Western Main Line, Midland Main Line, and the Cross Country Route), and it was quickly established that no single "off-the-shelf" diesel engine was capable of producing such power. Also a factor in the decision was that the use of two locomotives, operating in push–pull formation, would cause less wear on the rails than a single, much heavier, locomotive. The framework of the new locomotive, classified British Rail Class 41, was built at Crewe Works before being transferred to Derby Carriage and Wagon Works for completion. The design of the locomotive incorporated a driving desk fitted around the driver, a sound-proofed door between the cab and the engine room, and, unusually, no side windows. The prototype became the first diesel locomotive in British railway history to use AC alternators in place of a DC generator, with the output converted to DC when used for traction. The prototype train of seven coaches and two locomotives was completed in August 1972. By the autumn it was running trials on the main line and in May 1973 the prototype, now designated Class 252, set a world diesel speed record of 143.2 mph (230.5 km/h). The concept was proven in trial running between 1973 and 1976, and British Rail decided to build 27 production HSTs to transform InterCity services between London Paddington, Bristol, and South Wales. The appearance of the train is the work of British designer Kenneth Grange. Grange was initially approached just to design the livery for the train, but under his own impetus decided to redesign the body, working with aerodynamics engineers. He went on to present the new design to British Rail and persuade them to adopt it. 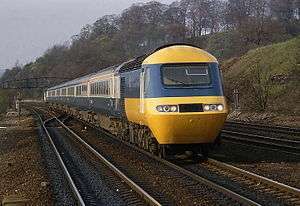 An InterCity 125 consists of two Class 43 diesel-electric power cars, each powered originally by 2,250 bhp (1,678 kW) Paxman Valenta engines (although they have since been fitted with different engines), and a set of Mark 3 coaches (typically 7 or 8). Normally there are two types of HST sets, 8+2 (5 standard class, 1 buffet, 2 first class) and 7+2 (4 standard class, 1 buffet, 2 first class), where the +2 refers to the power cars at each end of the rake. Key features of the design are the high power-to-weight ratio of the locomotives (1678 kW per ~70-tonne loco), which were purpose-built for high-speed passenger travel, improved crashworthiness over previous models, and bi-directional running avoiding the need for a locomotive to run around at terminating stations. Until the HST's introduction, the maximum speed of British trains was limited to 100 miles per hour (161 km/h). 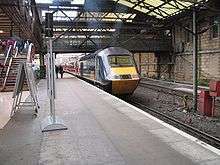 The HST allowed a 25% increase in service speeds along many lines they operated. Deliveries continued through 1976, and on 4 October a partial service of HSTs running at 125 mph (201 km/h) began on the Western Region. A radical update of the standard BR livery on the power cars was complemented by the 'Inter-City 125' branding, which also appeared on timetables and promotional literature. By the start of the summer timetable in May 1977, the full complement of 27 Class 253 sets (253001–253027) was in service on the Western Region, completely replacing locomotive-hauled trains on the Bristol and South Wales routes. Passenger volumes on the trains rapidly increased due to the speed and frequency of the service, an effect previously seen only when electric trains had replaced diesel or steam services. The displacement by HSTs of the British Rail Class 50 locomotives to slower services effectively finished off the last 'Western' Class 52 diesel-hydraulics by early 1977. Not only did the HST bring considerable improvements in service on the railways, British Rail entered a period of active marketing which accompanied and supported the train's introduction. The Intercity service overall had become a vast success for British Rail. InterCity 125 in London Paddington in 1988. The prototype InterCity 125 (power cars 43000 and 43001) set the world record for diesel traction at 143.2 mph (230.5 km/h) on 12 June 1973. An HST also holds the world speed record for a diesel train carrying passengers. On 27 September 1985, a special press run for the launch of a new Tees-Tyne Pullman service from Newcastle to London King's Cross, formed of a shortened 2+5 set, briefly touched 144 mph (232 km/h) north of York. The world record for the fastest diesel-powered train, a speed of 148 mph (238 km/h), was set by an HST on 1 November 1987, while descending Stoke Bank with a test run for a new type of bogie, later to be used under the Mark 4 coaches used on the same route. First Great Western HST passing Old Oak Common Train Maintenance Depot. From 2005 the First Great Western HSTs were re-engined with MTU power units, while at the same time the coaches were refurbished. Units for services in the M4 corridor/Thames Valley to Bristol, Hereford, Oxford, Exeter and Cardiff were converted into a high-density layout of mostly airline-style seats (only two tables per coach). This was in order to provide more seats for commuters. The remainder (for the routes to Swansea and the West Country) kept the tables. The refurbished coaches have new seating (leather in first class), at-seat power points and a redesigned buffet bar. Some standard class carriages now have a Volo TV system. Highland Chieftain InterCity 125 departing Falkirk Grahamston. All Virgin Trains East Coast services north of Edinburgh to Aberdeen and Inverness use InterCity 125 sets, but the services to Glasgow Central use InterCity 225 sets. The basic East Coast (ECML) formation was originally 2 + 8, increased to 2 + 9 in 2002 when extra stock became available. The ECML formation is nominally two first-class coaches, one buffet (with further 1st Class seating) and five (later six) standard-class coaches, sandwiched between the buffet and power cars. For a few years, formations included a TRUK (trailer restaurant kitchen) and buffet car as well as TS (trailer second class) and TF (trailer first class) coaches, many formations being 4 × TS, TRUK, Buffet, 2 × TF. Nine trailer car units followed this formation, with the addition of a TS. 'Pullman' services replace a TS with an additional first-class coach. After privatisation, InterCity sets were operated by Great North Eastern Railway (GNER), alongside electric InterCity 225 units from London to Newcastle and Edinburgh, as well as beyond the electrified sections (or where British Rail Class 91s cannot operate due to route availability restrictions) such as services to Hull, Skipton, Harrogate, Inverness and Aberdeen. 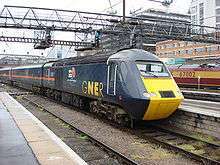 In January 2007 the first of GNER's 13 refurbished HSTs was unveiled, with the coaches rebuilt to the same 'Mallard' standard as its InterCity 225 electric sets with similar seating, lighting, carpets and buffet cars. Members of this fleet which have been refurbished have had '200' added to their original numbers. The power cars were upgraded with MTU engines. The first of the HST Mallards was in service by spring 2007. In 2007 the franchise was taken over by National Express East Coast, which continued the re-engining programme begun by GNER, and completed the refurbishment of the fleet in March 2009. Two power cars were transferred to First Great Western early in 2009. The final Mallard-upgraded Mark 3 coaches entered service with NXEC in October 2009. Following an announcement by the National Express Group that it refused to provide further financial support to its subsidiary National Express East Coast, the NXEC franchise ceased on 13 November 2009, and the operation of the route returned to public ownership. As a result, the 13 sets are now operated by Department of Transport operator East Coast (as of late 2009). East Coast introduced a new InterCity 125 service to Lincoln in 2011. The InterCity 125 was replaced by the electric InterCity 225 on the line to Skipton when the electrical infrastructure was upgraded. In total, 8 East Coast services per day in each direction use the InterCity 125. 43072 (now 43272), 43074 (now 43274) in 2012 have been transferred to East Midlands Trains re-engined MTU engines. In April 2015, Virgin Trains took over operation of the East Coast franchise as Virgin Trains East Coast. Grand Central InterCity 125 set departing London King's Cross with a service to Sunderland in 2011. All Grand Central Class 43 power cars have exposed front buffers due to previous use as surrogate DVTs. In 2006, Grand Central Railway obtained six Class 43 power cars to operate its London-Sunderland passenger service via the East Coast Main Line. The service was due to begin in December 2006 although upgrade work to enable the coaching stock (which was formerly used for locomotive-hauled services and has a different electric heating/power supply system) to operate with Class 43 power cars was heavily delayed and therefore pushed the starting date back to 18 December 2007. HSTs 43084 and 43123 were the final operational Paxman Valenta power cars, being re-engined in 2010 with the MTU treatment. While at the works being re-engined, Grand Central added the orange stripe that appears on their Class 180 units, re-painted the front ends (this making them look more like the non-buffered HSTs), and re-numbered the power cars into the four-hundreds. These are the current numbers: 43465 (065)/467 (067)/468 (068)/480 (080)/484 (084)/423 (123). The re-numbering of 43123 was confusing to some enthusiasts, as they sometimes believed it was originally 43023 because 400 was added to the numbers of the other power cars, yet only 300 to this particular power car. On the London Midland Region, InterCity 125 trains were introduced later than on the other regions. They initially appeared on the former Midland Railway route from London St. Pancras to Sheffield and Nottingham. Although they were initially not permitted to exceed 100 mph (161 km/h) on any part of the route, they still delivered time savings compared with the loco-hauled trains they replaced. Most long-distance services on this route have been transferred to new Class 222 Meridian diesel-electric multiple units, although many London services from Nottingham still use the InterCity 125, as do all services from London St Pancras to Leeds. Members of this fleet are currently being re-painted at the company’s Neville Hill Depot in Leeds; they have been refurbished with a different power unit to FGW and NXEC sets and are retaining their original numbers. 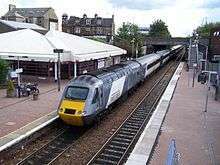 Midland Mainline inherited HSTs from BR after privatisation and operated them on its primary services at up to 110 mph. 43089 also was returned to work on the mainline after being used in an experimental programme conducted by Network Rail and Hitachi. 43072, 43074 was transferred to East Coast in 2012. Currently 24 are in service with East Midlands Trains. Since December 2013, InterCity 125 sets have been permitted to operate at speeds of up to 125 mph on certain parts of the routes from London St Pancras to Leeds and Nottingham. HST power car in Cross-Country livery, seen here at Bristol Parkway. CrossCountry operates these trains on its northeast-southwest services. In 2007 the franchise passed to CrossCountry (an Arriva subsidiary). Because of overcrowding, Cross Country reintroduced five HSTs to supplement its Voyagers. In late September 2008 Cross Country refurbished its first HST set. The coaches have been refurbished to a similar "Mallard" standard as GNER trains, though their interior is in burgundy and there are fewer tables. They also differ from the East Coast sets by having electronic seat reservations, and the buffet car has been removed, with all catering provided at-seat from a catering base in coach B. Most of the carriages are rebuilt from loco-hauled Mark 3s. The refurbishment was carried out by Wabtec, Doncaster Works. Each set has had a TS removed (now 2 power cars + 7 coaches). Four sets are now back in daily use again since December 2010, after only two sets were used in service (three on Mondays and Fridays) for a while in 2010. No explanation was provided for the sudden reduction in fleet usage. Virgin Trains HSTs regularly worked out of London Euston and Birmingham International to Holyhead and Blackpool North, until they were re-deployed in May 2004. Due to there being numerous curves on the West Coast Main Line, the trains were not permitted to exceed 110 mph on any part of the route. When the West Coast Main Line was upgraded by Network Rail in the 2000s, it became necessary to operate diversionary routes whilst work was going on. As a result, Midland Mainline was asked by the then Strategic Rail Authority (SRA) to operate services between London and Manchester via the Midland Main Line and Hope Valley Line into London St Pancras while West Coast Main Line renovation works took place. In a temporary operation dubbed Project Rio, a large percentage of the stored Virgin CrossCountry power cars were overhauled and returned to service in an enlarged Midland Mainline fleet. Ending on 10 September 2004, the Project Rio fleet was gradually disbanded, with power cars moving to First Great Western, GNER or CrossCountry. One HST set is in service with Network Rail, painted in departmental yellow, and often referred to as the "flying banana" (a nickname that was originally applied to the whole class because when first introduced by BR they wore a predominantly yellow livery). The set is the New Measurement Train. Class 43 Diesel locomotive 125 201 197 1975–1982 2 InterCity 125 power cars, operated in Top and Tail formation. Mark 3 Coach Passenger rolling stock 125 201 848 1975–1988 British Rail's third fundamental design of carriage, developed primarily for the InterCity 125. The 197 production series power cars were numbered 43002-43198. 43001 was applied to the second of the two prototype power cars, while the first of the pair (now preserved as part of the National Collection) became 43000 – unusual because BR TOPS classification numbered its locomotives from 001 upwards (this was because it was not, at the time, classified as a locomotive). Subsequently, on fitting of new engines, power cars operated by the InterCity East Coast and Cross Country franchisees have been renumbered in the 432xx or 433xx series (by adding 200 to their serial numbers), while Grand Central also changed the third digit of its power cars to 2 (by adding 200 or 100). In 2002, Class 255 was allocated for the reformation of some HST power cars and trailers into semi-fixed formation trains, to be known as Virgin Challenger units, for use by Virgin Trains. These formations would have had power cars sandwiching one Trailer First, a Trailer Buffet, two Trailer Seconds and a Trailer Guard Second. These plans came to naught as the Strategic Rail Authority planned to transfer most of the stock to Midland Mainline for its 'Rio' services between London and Manchester. The Intercity service proved an instant hit with the British public. By the early 1980s the HST had caught the travelling public's imagination, thanks in part to a television advertising campaign fronted by Jimmy Savile, together with the advertising strap-line "This is the age of the train". British Rail enjoyed a boom in patronage on the routes operated by the HSTs, and InterCity's profits jumped accordingly, with cross-subsidisation safeguarding the future of rural routes that had been under threat of closure since the Beeching Axe of the 1960s. There have been many model and toy guises of the IC125. One of the first in the UK was by Hornby Railways, which launched its first model version in 1977. This model was supplied with an incorrect length Mk3 coach which was shortened to allow the model to reliably negotiate the smallest radius curves. This was done by removing one of the 8 side windows rather than scaling the whole length. It was later released in InterCity 'Swallow' livery, Great Western green-and-white, Midland Mainline and Virgin Trains. Lima released its version of the IC125 in 1982, of which the Mark 3 coaches were correct to the lengths of the real-life coaches and included the guard's coach. Hornby eventually followed suit in the late-1990s, when its short Mark 3 coaches were replaced by correct scale length ones but omitted the guard's coach. Hornby released a totally new version of the InterCity 125 power cars in late 2008. Dapol produces an N gauge model of the train. Railway Shop (Hong Kong) produces a T gauge model (1:450 scale). Three Class 43 locomotives have been written off in railway accidents, all of which occurred on the Great Western Main Line. 43011 was written off in the Ladbroke Grove rail crash, 43019 was written off after the Ufton Nervet rail crash, and 43173 was scrapped at Pig's Bay in Essex after heavy damage in the Southall rail crash. In all cases, the damage was to the leading power car – the trailing end power cars at the other end of the HST set suffered only limited or no damage, and were returned to service. At Ladbroke Grove and Ufton Nervet the accidents were ultimately caused by factors not involving the HST sets or their drivers, although the set involved in the Ladbroke Grove crash had a faulty AWS system; however, the Southall accident was due to the HST colliding with a Freight train, which was entering Southall Goods Yard, at approximately 13.20 GMT, crossing the main lines. The immediate cause of the crash was the result of the driver of the HST passing a red signal without stopping. In addition, the leading power car of the set had a faulty Automatic Warning System which if operational would have alerted the driver to his error and possibly prevented the accident. Following investigation, this system has since been required to be kept operational and switched on for all use of the Intercity 125 fleet. In 2005, the train leasing company, Angel Trains, initiated and led an industry-wide programme to replace the 30-year-old Paxman Valenta engines in the HST power cars with new MTU 16V 4000 engines. The upgrade, which was part of a £110 million total investment made by Angel Trains on its fleet of High Speed Trains, included the re-powering and refurbishment of 54 HST power cars, then on lease to GNER (now Virgin Trains East Coast) (23), First Great Western (26) and CrossCountry (5). Virgin Trains planned a similar project in the early 2000s, but with the collapse of the programme the upgraded trainsets were sold along with their unupgraded stablemates. Additionally many operators undertook some sort of reburbishment programme on the Mark 3 carriages in the early 2000s. With the long-term delay and change of direction of the HST2 programme, operators began to refurbish their HST fleets in 2006 – both by remotoring with the more modern MTU4000 diesel engine, and by refurbishing the carriage interiors. It is anticipated that these overhauls will give the HST at least another 10 years in front-line service. As the Intercity 125 fleet has become old compared to most stock used in passenger service it has been recognised that it is near the end of its service life. More recently HSTs have been replaced (or augmented) by high-speed DMUs such as the Voyagers and the UK express version of Alstom's Coradia. These new DMUs have better acceleration than the HST due to a higher power/weight ratio, with greater efficiency and braking performance in addition. However, passenger comfort is reduced due to the vibrations and noise caused by the underfloor engines, compared to the much quieter Mark 3 coaches. In 2005 the initial concept of HST2 was rejected by the government and the rail industry as a like-for-like replacement for the HST fleet. In the light of this rejection, in 2006 existing operators turned to refurbishments of the Intercity 125 trains. Nevertheless, the HST2 concept was expanded and replaced by the Intercity Express Programme, with proposals for a joint replacement of both HST and Intercity 225 trains. The eventual successor to the two Intercity fleets is the Hitachi Super Express, comprising two classified types of fixed-rake formations: the BR Class 800 electro-diesel sets and the BR Class 801 electric multiple unit sets. On the Greater Western franchise, the current fleet of HSTs is expected to remain in service until at least 2017, the scheduled date for introduction of the Intercity Express. Legally in the UK, train operators are allowed to discharge 5 imperial gallons (23 l; 6.0 US gal) of sewage per carriage per journey, on to the track. Most Mk3 carriages have no toilet tanks, discharging directly onto the track. In the 2000s both the RMT trade union and politicians were concerned at the environmental impact of this legacy issue. The problem was first raised in 2003 after Railtrack staff at Nottingham abandoned local clean-up and then track maintenance procedures due to an excessive build up of sewage waste in the area. In 2006 the RMT agreed waste-tank and clean-out developments at Northern Rail's Heaton depot in 2006 with GNER, plus new clean-out procedures at all other depots, to solve an ongoing dispute over the previous 18 months. By 2011, the European Union had started a formal investigation to see whether trains composed of such carriages were breaking EU environmental and health laws, although the Environment Agency confirmed that train companies claimed special exemptions to dump waste along the tracks. In 2013, transport minister Susan Kramer branded the practice "utterly disgusting" and called on the industry to take action. ATOC responded by stating that, as all new vehicles had to be fitted with compliant toilet tanks, with withdrawal of the HSTs by the end of 2017 the problem would be solved. Unless the toilets are modernised, the cascading of stock onto other lines may continue this practice for many years after 2017 (see 'Replacements' paragraph above). All HSTs operating with Great Western Railway and Virgin Trains East Coast will be replaced by Class 800//801 trains by 2020. Twenty-seven sets each with four or five carriages are to move from Great Western Railway to Abellio ScotRail and be refurbished with controlled emission tanks and plug automatic doors. They will operate on services from Edinburgh and Glasgow to Aberdeen and Inverness. ↑ "HSTs are good to 2035". Railway Gazette International. London. 8 April 2011. ↑ "New train fleet to replace Devon, Cornwall and Somerset's ageing inter-cities". Western Morning News. Plymouth. 23 March 2015. 1 2 "Testing the prototype HST in 1973". traintesting.com. Retrieved 29 April 2009. ↑ "Everywhere and Nowhere". Financial Times. London. 27 May 2011. Retrieved 21 August 2011. ↑ Marsden, Colin (2001). HST: Silver Jubilee. Ian Allan. p. foreword. ISBN 0-7110-2847-8. ↑ "HST Power Car". National Railway Museum. Retrieved 18 May 2009. ↑ Collins, R.J. (May 1978). "High speed track on the Western Region of British Railways". Proc. Institution of Civil Engineers. Institute of Civil Engineers. 64 (2): 207–225. doi:10.1680/iicep.1978.2755. Retrieved 2 October 2015. ↑ "1976: New train speeds into service". BBC News. 4 October 1976. Retrieved 28 April 2009. ↑ Owen, A.D.; Phillips, G.D.A. "The Characteristics of Railway passenger demand" (PDF). University of Bath. p. 234. ↑ "New opportunities for the railways: the privatisation of British Rail" (PDF). Railway Archive. p. 8. Retrieved 18 May 2009. 1 2 "Paxman and Diesel Rail Traction". Richard Carr's Paxman history pages. 3 March 2012. Archived from the original on 2 April 2011. Retrieved 4 March 2012. ↑ "Intelligence August 2002". Railway Gazette International. London. 1 August 2002. Archived from the original on March 5, 2008. Retrieved 3 March 2012. ↑ "Rail Timeline". BBC News. London. Retrieved 7 April 2008. ↑ Hollowood, Russell (16 March 2006). "The little train that could". BBC News. London. Retrieved 7 April 2008. ↑ "Trains undergo GBP63m redesign". Europe Intelligence Wire. 18 January 2007. Retrieved 18 May 2009. ↑ "New look trains for First Great Western". First Great Western. Retrieved 20 May 2009. ↑ "GNER wins British franchise". International Railway Journal. 1 April 2005. Retrieved 18 May 2009. ↑ Stirling, Tom (12 March 2007). "Makeover for GNER 125 trains". The Press. York. Retrieved 18 May 2009. ↑ "National Express East Coast launches final refurbished and upgraded HST power cars back into service" (Press release). National Express Group. 13 March 2009. Retrieved 18 May 2009. 1 2 InterCity 125 Group fleet list. ↑ "DEMU inspection ensures quality". Railway Gazette International. London. 1 March 2005. Retrieved 18 May 2009. ↑ "Change to our trains" (Press release). East Midland Trains. 17 March 2008. Retrieved 27 August 2009. 1 2 "Hitachi reveals 200km/h hybrid HST". International Railway Journal. June 2007. Retrieved 18 May 2009. ↑ "New dawn for Virgin Trains". Virgin Group. 13 June 2001. Retrieved 18 May 2009. ↑ "New beginning for CrossCountry train travel" (Press release). Cross Country. 11 November 2007. Retrieved 18 May 2009. ↑ "Track access agreement between Network Rail and Midland Mainline" (PDF). Track Access Executive. Retrieved 6 January 2008. 1 2 "Privatisation 1993–2005". 125group.org.uk. Retrieved 19 May 2009. ↑ "Network Rail, Britain, has unveiled its new 200km/h measurement train". International Railway Journal. 1 August 2003. Retrieved 18 May 2009. ↑ "Towards Sustainable Technology in Transport Sector" (PDF). Hitachi. Archived from the original (PDF) on May 16, 2008. Retrieved 18 May 2009. ↑ Morrison, Gavin (2007). Heyday of the HST. Ian Allan. p. foreword. ISBN 0-7110-3184-3. ↑ "BR livery HST 4/19 C.I.M.". BR. Retrieved 3 December 2013. ↑ Parkin, Keith (2006). British Railways Mark 1 coaches (Revised ed.). The Historical Model Railway Society. pp. 67–73. ISBN 0-902835-22-X. ↑ "BR InterCity Executive HST 125 High Speed Train". Model Railways Direct. Retrieved 18 May 2009. ↑ "Examples of different liveries on HSTs". therailwaycentre.com. Retrieved 18 May 2009. ↑ Campbell, Joe (4 October 2006). "High Speed Train marks 30 years". BBC News. Retrieved 29 April 2009. ↑ "Both English, French trains getting fancy". The Atlanta Journal-Constitution. 8 September 1985. Retrieved 29 April 2009. ↑ Mitchell, Alan (8 March 1990). "Train of Thought". Marketing. Haymarket Business Publications. Retrieved 29 April 2009. ↑ Wake, Tony (14 September 2007). "Rod Allen Advertising 'jingle king' (obituary)". The Independent. London. Retrieved 14 February 2015. ↑ An example of this advertising campaign can be found through online video sites such as YouTube. ↑ Gottlieb, A. Harold (24 September 1987). "Can Railroads Come Back at High Speed? (Letter to the editor)". The New York Times. Retrieved 29 April 2009. ↑ Barnett, Roger. "British Rail's InterCity 125 and 225" (PDF). University of California Transportation Centre. Archived from the original (PDF) on 29 May 2008. Retrieved 17 May 2009. ↑ "A Hornby BR InterCity 125 High Speed Train model". Hornby. Archived from the original on March 1, 2009. Retrieved 28 April 2009. ↑ The Ladbroke Grove Rail Inquiry – Part 1 Report (PDF). Health and Safety Commission. 2001. ISBN 0-7176-2056-5. Retrieved 1 March 2012. ↑ "Preliminary report into railway accident at Ufton Nervet" (PDF). Rail Safety and Standards Board. 25 January 2005. Retrieved 1 March 2012. ↑ "The Southall rail accident inquiry report: Summary of progress" (PDF). Health and Safety Commission. February 2002. Retrieved 1 March 2012. ↑ "Clear plans for the future of the HST fleet" (Press release). Angel Trains. Retrieved 18 May 2009. ↑ Dooks, Brian (25 May 2006). "GNER's high-speed trains to become lean, green machines". Yorkshire Post. Leeds. Retrieved 29 April 2009. ↑ "State leads Britain's high speed train replacement strategy". Railway Gazette International. November 2005. Retrieved 18 May 2009. ↑ "Fitting the MTU power unit into the HSTs". railwaypeople.com. Retrieved 18 May 2009. ↑ "Official video by First Great Western documenting the refurbishment programme". Youtube.com. Retrieved 6 September 2009. ↑ "A refreshing change! First Great Western's Intercity 125 fleet looked tired and old-fashioned—but a radical upgrade means these 30-year-old trains are now better than ever". International Railway Journal. 1 July 2007. Retrieved 28 April 2009. ↑ "Intercity 225: Fastest in the fleet". BBC News. 17 October 2000. Retrieved 28 April 2009. ↑ Clark, Andrew (18 October 2004). "Intercity 125 nears the end of the line". The Guardian. London. Retrieved 28 April 2009. ↑ "Strategic Business Plan: Rolling Stock paper" (PDF). Network Rail. October 2007. Retrieved 18 May 2009. ↑ "Alternative train vehicles – Light Diesel Multiple Units" (PDF). Sonoma-Marin Area Rail Transit. Retrieved 18 May 2009. ↑ "Experts cast doubt over rail revolution". Europe Intelligence Wire. 16 March 2006. Retrieved 18 May 2009. ↑ "Intercity Express Programme, United Kingdom". railway-technology.com. Retrieved 28 April 2009. ↑ "Agility Trains to supply Super Express fleet". Railway Gazette International. London. 12 February 2009. Retrieved 12 February 2009. ↑ Geoghegan, Tom (24 July 2003). "Toilet waste 'hampers rail repairs'". BBC News. Retrieved 13 November 2013. ↑ "End 'disgusting' train toilet sewage – Lady Kramer". BBC News. 13 November 2013. Retrieved 13 November 2013.